"The best general account of the subject . . . thoroughly researched and expertly written." "Davenport-Hines knows the mercuriality and multiplicity of his subject. His book is a technical triumph: well researched, well-written, well presented. . .Moreover, it is convincing." "[The Pursuit of Oblivion] strips away the propaganda, prejudice, rumor, rhetoric and misinformation that has sullied the drugs debate until now. . . . The most important study on this subject in years, perhaps ever. Everyone with any influence on government policy should read this book and wake up." 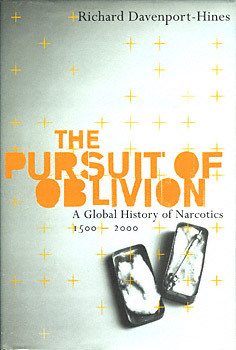 "For all the countless books published on illicit drugs, The Pursuit of Oblivion still manages to tell us so much that is new. In a highly literate and readable account, Davenport-Hines succeeds wonderfully in tracing the story of illicit drug use over the centuries, showing the historical and political accidents that resulted in the lines being drawn between dangerous "drugs" and helpful "medicines." And at a time when globalization has become such a buzzword, it's good to find an author who is so thoroughly conversant with the international and intercontinental aspects of drug policy." "The Pursuit of Oblivion is an amazing, knock-your-socks-off book, argued with depth and cunning. The author's deep learning is put in the service of such an unexpected argument and the writing is so precise and fine that one might expect a self-satisfied polemic. However, Davenport-Hines manages just the opposite: a profound and moving meditation on, not just a history of, our need for dreams, escape, help for pain, and new lives we might somehow use to supplement the shabby ones we find ourselves inside. This is a book about drugs, to be sure, but it is also a major work about the way we manage to keep our hearts alive. A stunning and vital book." -- James R. Kincaid, Aerol Arnold Professor of English, Univ. Of S. California.